Top Row (from left) - "Mick" Mullaney (c), unknown, Frank Colley (p) George "Reggie" Rawlings (of), "Hank" Hulvey (p-of), Norris? (1b), Walter Seaman (p-of). Bottom Row (from left) - Dave Black (2b), Ross Roberts (p), Joe Brehaney (ss), Lewis R. "Hack" Wilson (of), H. Burton Shipley (mgr), Joe Brophy (3b). HAGERSTOWN, MD - While the New York Yankees had “the Babe”, as in Ruth, the Class D, Blue Ridge League had their own, “Babe”, as in Martinsburg’s Lewis Robert Wilson. Wilson, who would later be nicknamed “Hack” during his career in the Major Leagues, and eventually be enshrined in the Baseball Hall of Fame, gave many fans of the little Class D league along the northern end of the Blue Ridge mountains something to cheer about. Wilson and veteran Blue Ridge Leaguer, George “Reggie” Rawlings dominated the league, leading Manager Burton Shipley’s Martinsburg club to their first league pennant, since 1914, when the town was in the old Tri-City League. Rawlings was the league’s most valuable player, and Wilson was the league’s most powerful slugger, reminding everyone of “Babe” Ruth, with his home run prowess. Wilson established a new league record with 30 home runs, in just 84 games played. Rawlings was not far behind, cracking out 26 homers, both breaking the previous league mark of 20, set the year before by Waynesboro’s Wally Kimmick. As a team, the Blue Sox accounted for a record 123 home runs, many coming from their home field at Rosemont Park. How dominant were these two players? Wilson, himself, hit as many home runs (30) as the entire Hanover Raiders team. Wilson and Rawlings’ 56 combined home runs were also more than Frederick (50), Chambersburg (36), and Waynesboro (33). Only last place Hagerstown’s 69 team home runs were more than the two Blue Sox sluggers. Rawlings led the league in batting, at bats, hits, singles, and was second in home runs behind Wilson, who also established another new league mark with a .717 slugging percentage. Though runs batted in were not counted in the league, Rawlings would have set a new league mark with 108 rbi’s, had they been counted. Wilson was not far behind, accumulating 94 rbi’s for the Blue Sox. Interesting enough, Rawlings, who married a Martinsburg girl during the off-season, started the season with the Waynesboro club, but became homesick, and asked Villagers Manager, “Country” Morris to be traded before the start of the season. Rawlings was traded to Martinsburg a few days before the season opened for an outfielder name Peddicord. Waynesboro later tried to nullify the trade, since Peddicord was soon released, but Baseball’s National Board of Arbitration upheld League President J. V. Jamison, Jr.’s in his decision on this transaction. 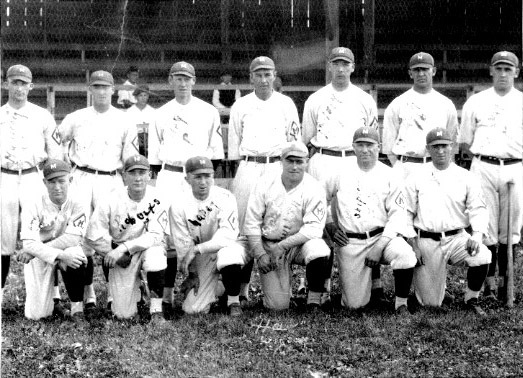 For Jamison, and the Class D, Blue Ridge League, the league faced a few bumps in the road, especially with the advent of illegal gambling at or near some of the ballparks, and the clarification of the “Class League Rule”, which resulted in Hagerstown forfeiting ten games the year before. With the same six clubs as 1921, the season started on May 15. Martinsburg Manager Shipley was unable to be with the club until early June, due his previous commitment of coaching the University of Delaware baseball team, so second baseman Dave Black filled in until Shipley returned to the helm. Frederick, Hanover, and Waynesboro each kept the same managers as the previous season, while former Major Leaguer and Hagerstown manager, Mike Mowrey, returned to his hometown to manage the Chambersburg club. Hagerstown hired former Baltimore Orioles catcher, Mickey Corcoran to manage last year’s cellar dwellers, but his stay in the league would last only one month. Corcoran had a rocky relationship with his players and the Hagerstown fans, and after only winning 10 of their first 31 games was abruptly released on June 18. Team President D. Lee Staley took over the team for four games, while looking for a replacement. He found a good one in Toney Walsh of Plymouth, PA, a first baseman, whose managing style was a major contrast to Corcoran. However, the Terriers never could find the right fit, winning only 31 games all season. The Hagerstown club caught a real scare after their Saturday, August 26 game in Hanover, as six players were injured, three seriously, when the car they were in crashed into a telegraph pole, while trying to avoid an oncoming train near New Oxford, PA. Second baseman John Layne, outfielder Holmes Diehl, and pitcher Bill Reilly were seriously injured in the accident, ending their baseball seasons. Three other passengers in the vehicle, pitchers Charles Mahan, William “Lefty” Russell, and third baseman Jim Kehoe were only slightly injured and returned to action. While the stories were abundant off the field, there still was baseball played on the field in 1922. At the end, the Blue Sox were crowned Class D, Blue Ridge League champions, with Waynesboro just 1 ½ games back, and Frederick four games back from the leaders. While Rawlings and Wilson received many accolades, they weren’t the only players making an impression around the league. Blue Sox teammate, Ross Roberts led all pitchers with 15 wins, and Mike “Hank” Hulvey and Walter Seaman each contributed to Martinsburg’s success both on the mound and at the plate. Waynesboro’s Harold Yordy, Luke Kaunas and Thompson helped keep the Villagers in the pennant race down the final week. Hanover’s Bill Goff continued to carry the load for the Raiders, hitting 16 home runs, while batting .344. Frederick, who led the league for most of the season, before faltering in August, had several key players, including outfielder Evan “Tubbie” Miller, infielders Ray Gardner and Joe Neptune, and pitchers Bill King, “Buck” Ramsey and Clarence Blethen. Some of the notable feats of the season was Martinsburg pitcher Seaman’s three home runs in one game vs Frederick. Martinsburg belted seven home runs in one game, also against Frederick. Waynesboro’s Alan “Lefty” Clarke no-hit Hagerstown, 4-0 on. A few players were signed by Major League clubs, including Wilson, who signed to play for the Portsmouth (VA) club in 1923. Wilson would be signed by the New York Giants the following year, 1924, beginning a short, but successful career in the Major Leagues. Wilson is known for holding the Major League record accounting for 191 RBI’s with the Chicago Cubs in 1930 . Ironically, the Blue Ridge League did not tabulate RBI’s as an official statistic at that time. At the end of the season, the Baltimore Sun again hosted a “Little World Series”, pitting the champion of the Class D, Blue Ridge League, against the winner of the new Class D, Eastern Shore League. On September 7, Martinsburg traveled to the Virginia Eastern Shore to play the Parksley (VA) Spuds of the Eastern Shore in a best- of-seven series to decide the state baseball champion. The Spuds were managed by former Blue Ridge League catcher, John “Poke” Whalen, who was a member of the original Blue Ridge league champions, the 1915 Frederick Hustlers. Four Blue Sox players hit home runs in the first game gave Martinsburg an 8-3 win in the first game in Parksley. Blue Sox ace, Walter Seaman shutout the Spuds, 3-0 in game two, thanks to a home run by Jim Brehany. Brehany’s suicide squeeze bunt in the 11-inning of game three gave Martinsburg a thrilling, 2 to 1 victory, as Roberts outdueled Parksley ace, Clayton to give the Blue Sox a 3 to 0 game advantage. Martinsburg swept the series in four games with a 4-0 whitewashing on September 11, behind the arm of Kirk Heatwole. The game featured a triple play in the third inning when Parksley’s Klinghoffer lifted a soft fly ball to Blue Sox right fielder Jacoby, who threw out the runner trying to score from third, and catcher Mike Mullaney relayed the ball to second sacker Dave Black, who tagged out the runner trying to tag up from first base.